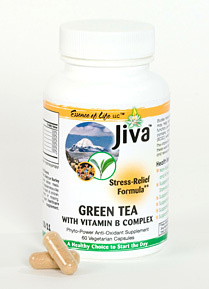 JIVA Green Tea Plus formula contains powerful all natural antioxidants from green tea blended with a Vitamin B complex to help support a healthy immune system and inflammatory response, and to enhance the body's natural energy and stamina levels. Studies have shown that drinking four cups of green tea a day can reduce the risk of developing heart disease. 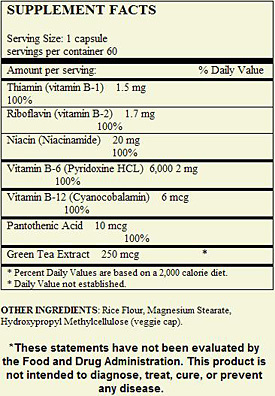 Green tea contains, among others, the flavonoid epigallocatechin gallate (ECGC). ECGC is as much as 100 times more powerful an antioxidant as vitamin C, and 25 times more powerful than vitamin E. ECGC also may account for the antibacterial properties of green tea. The vitamin B complex consists of eight water soluble vitamins. The B vitamins work together to boost metabolism, enhance the immune system and nervous system, keep the skin and muscles healthy, encourage cell growth and division, and other benefits to your body. antioxidant Tea Stress-Relief. For health maintenance 1-2 capsules before meals. To support immune system and joint health: 2 capsules 3 times a day before meals. If you are pregnant or nursing, please consult your healthcare practitioner before taking any dietary supplement.